Dogs can get breast cancer too, so learn what you can do to reduce your pup's risk. October is Breast Cancer Awareness Month…and it’s hard to go anywhere without a reminder of how many people this disease impacts each year. But, did you know that breast cancer impacts our dogs too? In fact, mammary cancer is one of the most common types of cancer faced by our canine companions, and female dogs are 3 TIMES more likely to develop a mammary tumor than a human woman. So, in honor of this special month, we wanted to provide an overview of mammary cancer in dogs – which dogs are at highest risk, how it is treated, and how it can be prevented (and this type of cancer is NEARLY 100% PREVENTABLE in dogs). Most dogs have ten mammary glands, five on each side of their body. Tumors can develop in any of these glands and the tumors can vary widely – from completely benign to very aggressive. It is difficult to know which type your dog may have without a full biopsy of the tumor. While a fine needle aspirate can rule out other types of lumps and bumps, to really know what type of mammary tumor it is, and how aggressive, the lump should almost always be surgically removed and biopsied. The good news is that half of all mammary tumors are benign, so if your dog develops a mammary tumor, don’t panic. It may not be as serious as you think. Of those tumors that are malignant though, 50% will metastasize, or spread, to the lungs, lymph nodes, or other parts of the body. 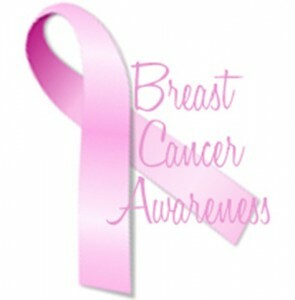 So, early detection and treatment can be critical. Some breeds are predisposed to certain types of cancer, and mammary cancer is no exception. Breeds at highest risk for developing mammary tumors include Cocker Spaniels, Brittany Spaniels, English Springer Spaniels, Pointer breeds, Toy and Miniature Poodles, Dachshunds, Maltese, German Shepherds and Yorkshire Terriers. But the most important predictor of whether or not a dog will develop a mammary tumor is whether or not they have been spayed, and more importantly, WHEN they were spayed. If a dog is spayed before their first heat cycle (usually around 6 months old), their chance of developing mammary cancer is reduced to approximately 0.5%. Less than one percent chance!! Spaying just after the first heat cycle increases the risk to about 8%. And if you wait until after the second heat cycle? The risk jumps up to more than 25%, and appears to offer little protection against eventually developing a tumor. Male dogs, by the way, have very little risk of developing mammary cancer, although it can happen. Surgery is the primary treatment option for treating mammary cancer. Generally, the mass will be removed immediately in order to biopsy it, and if the pathology report shows clean margins around the mass (no cancer cells), it is considered a curative surgery. But, if the tumor appears to be more aggressive, or if clean margins are not obtained, a more aggressive surgery may be performed. Depending on the circumstances, the vet may also suggest x-rays prior to the biopsy in order to see how extensive the tumor is and if it has spread to the lungs. If the dog has not yet been spayed, the vet might also recommend that this surgery be performed right away too, as this may reduce your dog’s risk of developing additional tumors. To really reduce the likelihood of new tumor development, veterinary oncologist, Dr. Susan Ettinger, co-author of “The Dog Cancer Survival Guide” suggests discussing a radical mastectomy with your doctor, which removes the entire chain of mammary glands associated with the tumor rather than just removing the mass. Chemotherapy may be recommended in some cases in order to prevent or delay metastasis to other parts of the body, but if the cancer has already spread, this approach is not typically very effective. This is, in part, why getting a full pathology report and x-rays up front can be so helpful – to provide realistic expectations and to ensure that your efforts are put into those things likely to do the most good. Radiation therapy is not commonly used for this type of cancer in dogs. Keep your dog at a healthy weight – just as with humans, obesity and high intake of dietary fat can increase risk of developing breast cancer. Check your dog for lumps and bumps monthly. In dogs, the two mammary glands (closest to the tail end) are the most likely to develop a tumor, so pay special attention to this area. If you find something – get it checked by your vet immediately. Feed your dog a high quality diet (food is the foundation for all good health). **Large breed dog owners: Some research has indicated that early spaying & neutering may affect your dog’s risk of developing other types of cancer, in particular osteosarcoma, which is more prevalent in large breed dogs. You are encouraged to discuss all of the pros and cons about the timing of this decision with your veterinarian, as in some cases it may be more beneficial to wait until the dog is slightly older. For more information about this topic, CLICK HERE. This entry was posted in Cancer Treatments and tagged breast cancer in dogs, canine cancer, canine mammary cancer, dog cancer, dog cancer survival guide, mammary cancer. Bookmark the permalink.